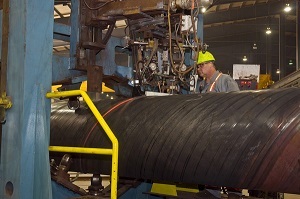 EVRAZ Portland facilities produce plate, coil and large diameter spiral line pipe. The Portland Spiral Mill converts steel coils from the adjacent Rolling Mill into high strength, large diameter API-grade pipe for oil and gas transmission lines and structural applications. Portland also features a coating facility. Through an innovative process, fusion-bonded epoxy and abrasion resistant coatings are applied to pipe exteriors for maximum durability. Pipe interiors are coated with epoxy paint for maximum flow efficiency.